Azerbaijan. A country I know very little about. I have a feeling I’m going to say that a lot during this challenge. I had thought I was quite well travelled, but when I look at how many countries there actually are, it makes me realise that I have only scratched the surface. Admittedly, some countries I probably wouldn’t want to visit (I won’t name names!) and there will definitely be others that I would love to see, but never will, so at least I’ll get to taste some of their food! Anyway, after baking and tasting this little treat, I’m hooked. 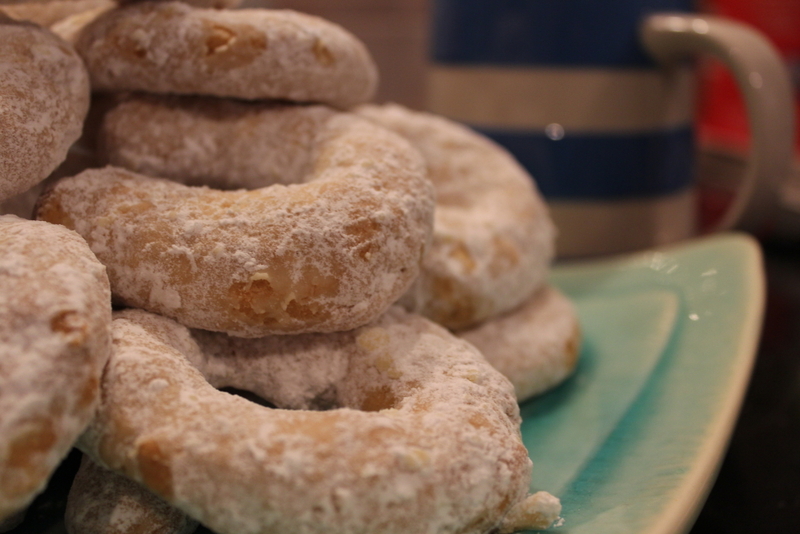 Kurabiye are buttery, crumbly biscuits and have a similar taste and texture to shortbread. They originated in Azerbaijan, but Turkey, Greece, Albania, Mexico, Spain etc all seem to have their own versions. After making them, I can see why these sugar-coated treats are a popular choice for celebrations such as weddings, Christmas, christenings – they look so pretty on a plate and much more special than some other biscuits. I’m not sure if it’s the icing sugar, but it just adds a little something extra to it – dresses it up maybe. Whatever it is, I think it’s a shame if they only get eaten on special occasions as I think they should be eaten all year round! 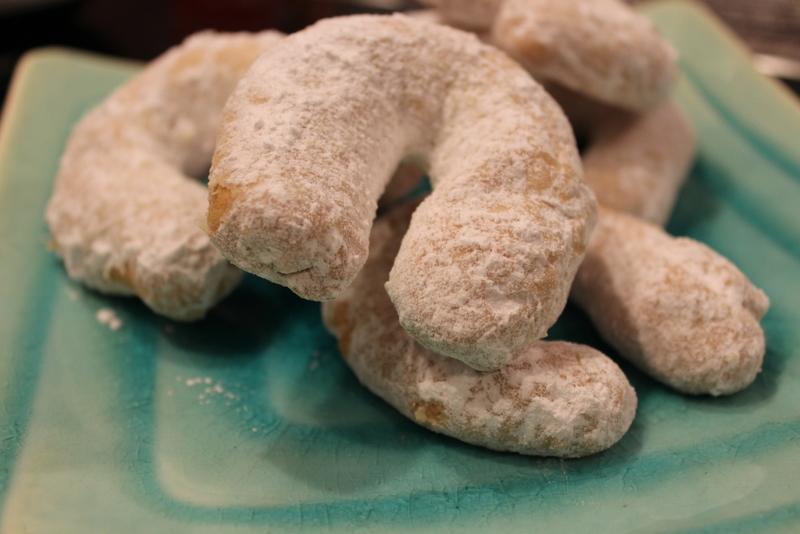 The shape of the biscuit seems to vary depending on where it comes from but I found recipes suggesting they’re shaped as balls or crescents, so it’s up to you (although don’t take my word for it, as the shape may be specific to the country and I haven’t quite worked out which is traditional for Azerbaijan). I recommend you try them – they were easy to make, ready in no time at all and the sweet, biscuity, vanillary smell that wafted out of the kitchen while they were cooking was heaven. My hubby is not a massive fan of shortbread (strange man) but he thought they tasted yummy too! This recipe is courtesy of mbakes, and I think hers is a Turkish recipe from her Mum so technically speaking I should really be classing this as my Turkish dish (yes, call me a cheat) but as they’re right next door and the biscuit seems to be popular in loads of different countries I’m ticking Azerbaijan off my list. It’s my challenge – I can make up the rules!! Anyway, I’ve already got my choice sorted for Turkey – baklava – just need to get round to making it. Preheat the oven to 180C and line two baking sheets with baking paper. Cream the butter and sugar together until incorporated. The mixture should still be yellow, not pale. Whilst creaming, add the egg, oil and vanilla. Mix for 30 seconds, there should still be lumps in the mixture – it looks a bit curdled. Sift in half the flour and mix it in with your hands. 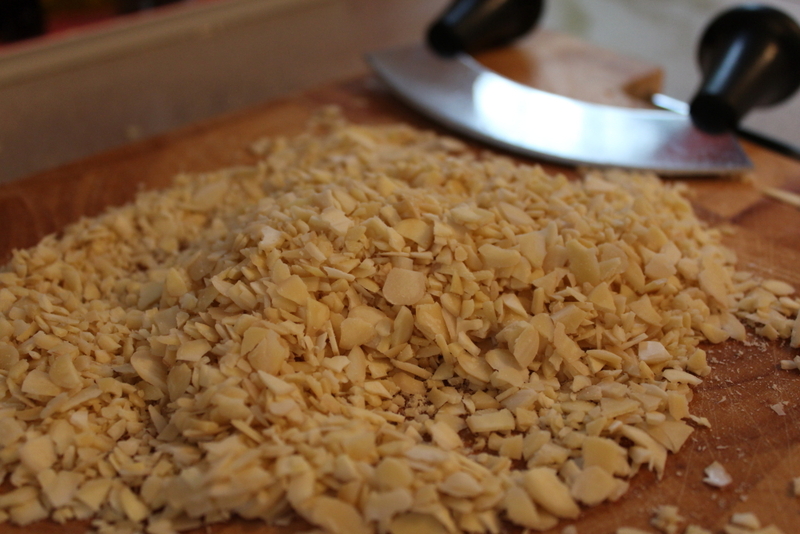 Then mix in the rest of the flour with your hands, and then all of the almonds. Try not to over-mix. If the mixture still feels wet (mine was very wet), add 2 tbsp extra flour, and continue adding until you get a dough that is not too greasy and that can be moulded into shape. I probably added an extra 4-6 dessert spoons (can’t exactly remember). Take a golf ball sized piece of dough and roll into a 10cm sausage with the palms of your hands. Arch the sausage into a crescent and place on the baking sheet. Repeat with the rest of the dough, the horns should be spaced 2cm apart. Bake for 25 mins, or until the bottoms of the biscuits are evenly golden (mine only needed 20 mins). Leave to cool on the sheets for 5 minutes. Pour the icing sugar into a bowl. 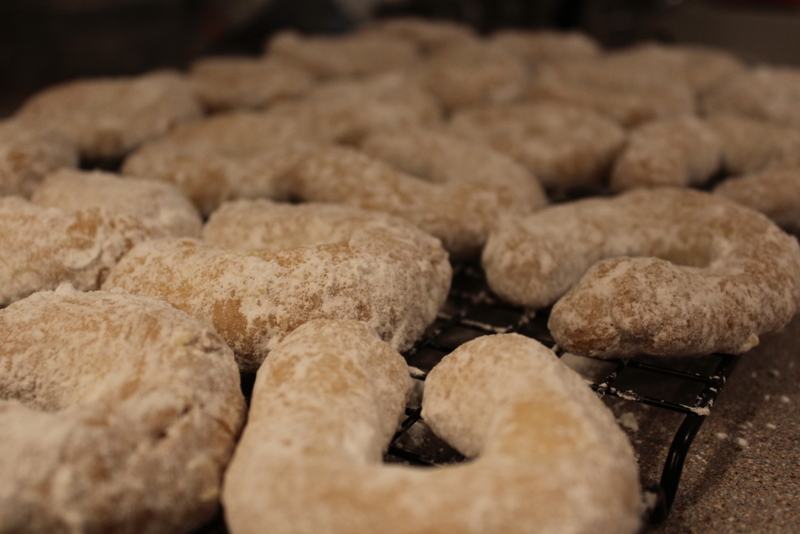 While the biscuits are still warm, immerse them into the icing sugar and toss around until fully covered. Leave to cool. The biscuits will stay fresh for 3 days if kept in an airtight container (if they last that long).